Incentives, sales to commercial fleets and a least a hint of overall economic recovery helped accelerate a comeback in Ford Motor Co.'s pickup and overall sales in September. Pickup sales are often considered a barometer for the overall economy, given their role in the housing industry. In 2009, Ford F-Series pickup sales fell about 20 percent to around 414,000. In 2010, the company has sold almost that many, around 386,000, in only nine months. Ford Chief Economist Ellen Hughes-Cromwick said in a conference call today that some economic indicators were positive in September, but she wanted to “see the whites of their eyes” and review the details before making too much of the September sales results. Overall sales for the Ford, Lincoln and Mercury brands jumped 46 percent in September from a weak year-earlier month to 160,873 units. 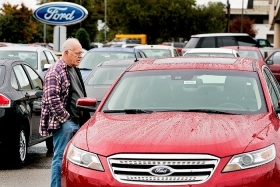 Light-vehicle sales rose 40 percent for the month and are up 19 percent for the year. Volvo purchases are no longer counted as part of the automaker's 2010 results since the August sale of the brand. The automaker has gained U.S. market share in 23 of the last 24 months, said George Pipas, Ford's U.S. sales analysis manager. Assuming Ford keeps that streak going, it will gain share in 2010 for the second year in a row, the first time the automaker has done that since 1993, he said. Ford downplayed the impact of incentives on its pickup sales, but in a promotion called “Built Ford Tough,” Ford offered zero-percent loans plus a $1,000 trade-in allowance in September. The deal runs through Oct. 4. Ford will follow that up in October with “Ford Truck Month,” said Ken Czubay, Ford vice president for U.S. marketing, sales and service. Czubay said Ford's incentives have been “stable” for the last six months and below the industry average. September sales of the flagship F-Series pickup climbed 40 percent from the year-earlier period to 47,433. For the year to date, F-Series sales rose 31 percent to 385,879. Sales shot up even more for the smaller Ford Ranger pickup: 86 percent to 3,815 in September. Year to date, Ford Ranger sales slipped 2 percent to 42,844. While market conditions have improved for pickup sales, Pipas said, most demand is still replacement demand driven by necessity.